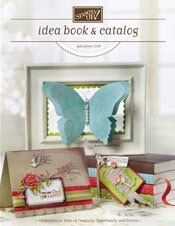 Today's Daily Special is "Anything But Cards" and I decided to create a mini scrapbook album using 4 x 6" chipboard. I am happy to tell y'all that I woke up with a clear head after over a week of being stuffed up and battling a cold. I feel free. Ha! I know I'm being silly but I really couldn't work on anything this whole week and it just feels good to be able to. Back to the scrapbook album. I created this mini scrapbook album using (5) 4 x 6" chipboards. I covered the chipboards with scrapbook papers with a "Spring Theme". The scrapbook papers are made by DCWV - Spring Value Pack. I always buy value packs because of the variety and the cost. I never ever buy individual scrapbook paper. It's just way too expensive and I can't see myself cutting them up knowing the cost. I punched a hole at the left corner and used a leaf binder ring to hold the scrapbook album together. To create the design of each page, I used scrapbook embellishments and rubber stamps. It's funny because I actually finished this scrapbook album in a few hours and considering there's a total of 9 complete pages plus the back, I finished it pretty quickly. I find it interesting because if I was creating cards, I would have made 9 of them in a few hours. I've never completed 9 cards in a few hours - it would probably take me two days to complete 9 cards. Why does it take me so long to make a card and only a few hours to make 9 full pages of a scrapbook album? It doesn't make sense to me. I wonder if other stampers find themselves in this situation? Anyway, it feels great to be back! I hope to be back to making all sorts of projects now that I'm almost back to normal!! I love your chipboard album. I love making the mini albums as they are so much fun. I also find I can do them quicker than the cards. Just curious though...where do you get the chipboard? Is it also sold in sheets?